It was hard to decide on my favourite spot at Onguma. Every staircase leads to a new adventure of nooks and crannies that must be explored. The sun invariably sets over the splendid “savannah ocean” called Fisher’s Pan. This is when nature puts on a show before the curtains of nighttime fall. And yes, wildlife abounds around the floodlit waterhole. I have to admit that every single sunset from the main area is brochure-perfect – whether on the upper roof area or on the terrace. But sipping a sundowner from your chalet’s terrace is just as memorable. 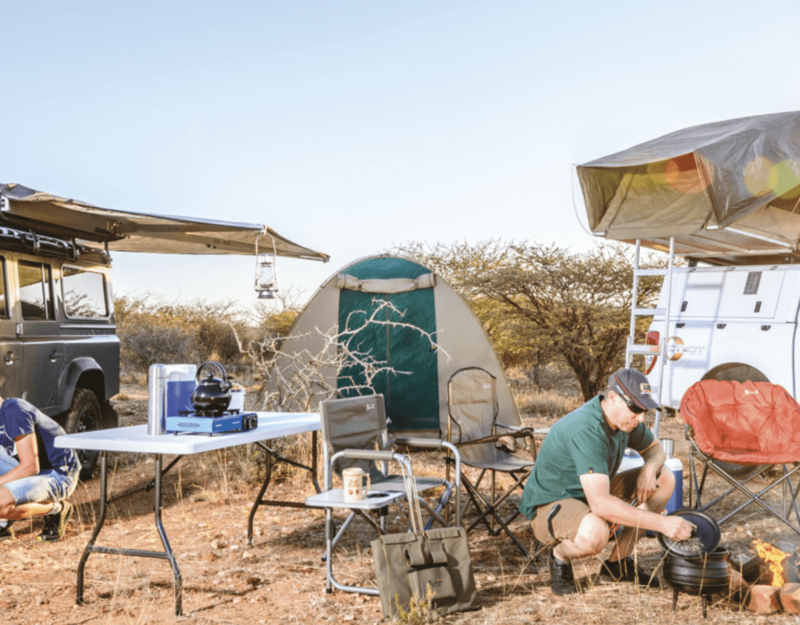 Khakis, beiges, browns and greens make way for something completely unconventional, namely a taste of Morocco in the Namibian bush. Upon entering the huge stone fort, I am mesmerised by the decor. An eclectic mix of colourful doors, cushions and lampshades decorate the dar-like, stone-cladded building. Yet nothing shocks the eye. 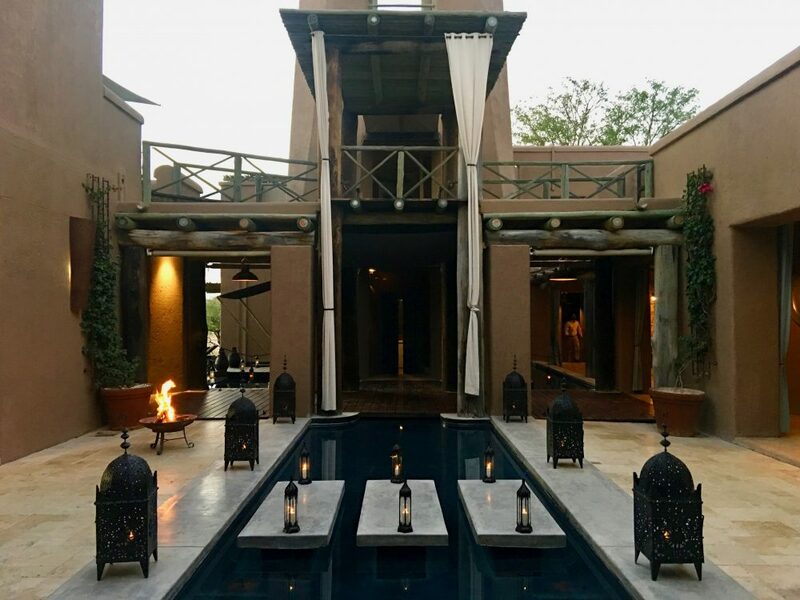 The central courtyard is characterised by shallow indigo pools surrounded by bonfires and lanterns. It is a visually-appealing, otherworldly experience. Then I hear the zebras outside and I remember I am right on Etosha’s doorstep. 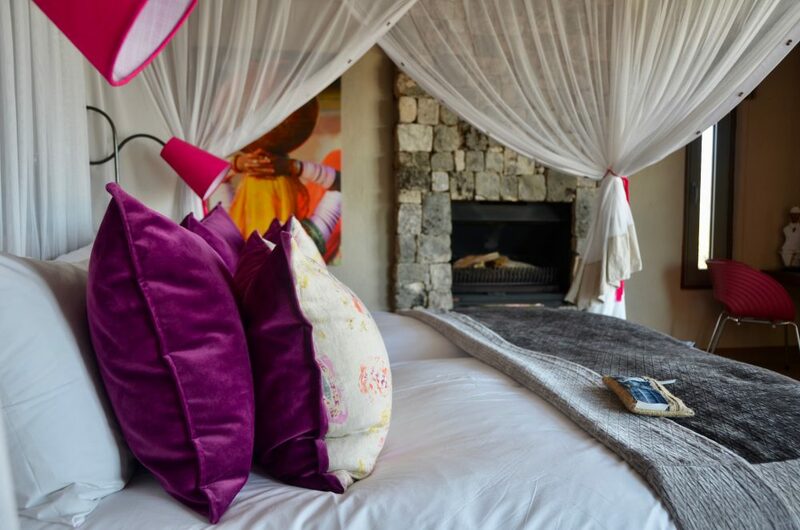 Each chalet is a tiny replica of the main building – small forts with an identical eclectic mix of vivid carpets, pillows, paintings and furniture. Chalets are situated 50 m from one another, enhancing the feeling of blissful solitude. Despite the nippy July draught, I take a shower at the outside facility. Why tear myself away from the view? Sundowners are equally fabulous from the privacy of our own little terrace with sun loungers. So, we pour ourselves drinks from the mini bar and enjoy hors-d’oeuvres delivered to our doorstep before heading to dinner. Being present at Onguma is already sufficient to balance every chakra in your body. But if you want to enhance the experience, treat yourself to a massage. Treatments are so much more than pure indulgent pampering. They are holistic, intuitive and tailor-made to improve mental, physical and emotional wellbeing. Discover more here. No two dinners are the same. As a result, each meal will take you on a journey of its own. 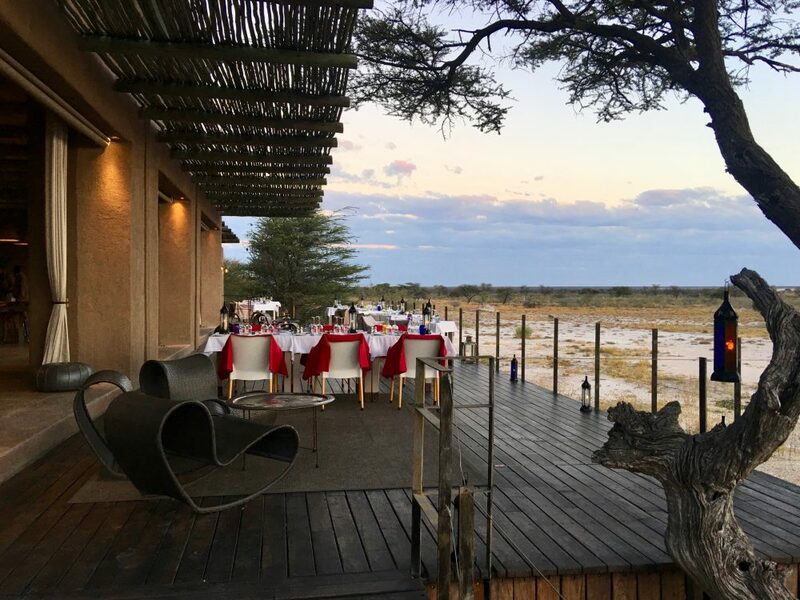 We enjoyed dinner on the terrace every night with the floodlit waterhole at centre stage. 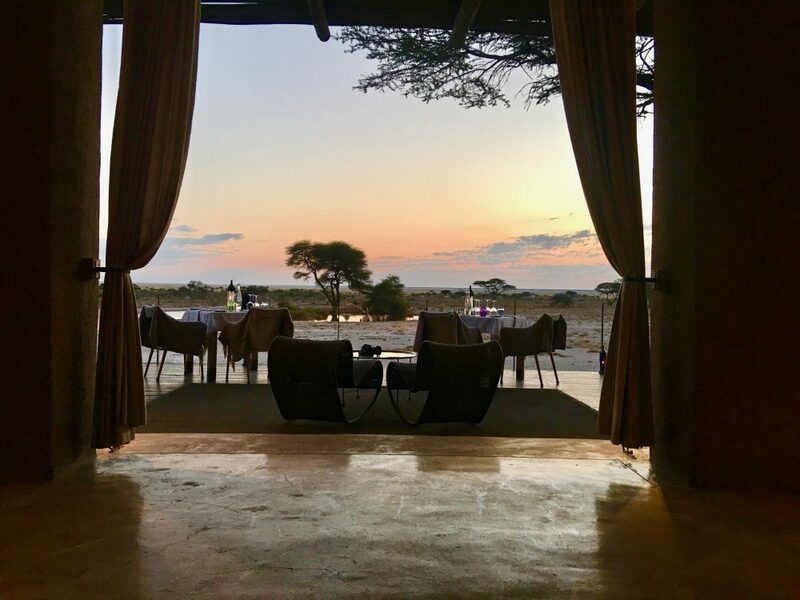 Dusk is the curtain that unveils a world unto itself – the waterhole becomes the theatre – elephants, lions, zebras, vultures and other animals will put on a show that not even Broadway will ever be able to present. All of the above-mentioned points are enough to turn the most uncreative and even hard-bitten person into a poet. I, for one, am much more comfortable in crafting with words than pictures. My drawing abilities are nothing to boast about. But when I discovered the drawing set in the room while the crackling flames from the fireplace kept me company, I gave my inner child free rein. So I sketched what first came to mind – the animals that we have encountered on our journey thus far. If you are anything like me, you might feel the urge for some form of movement. That’s where the pool comes in handy. Here you can swim a few lengths. But don’t worry about it too much – you are on holiday! 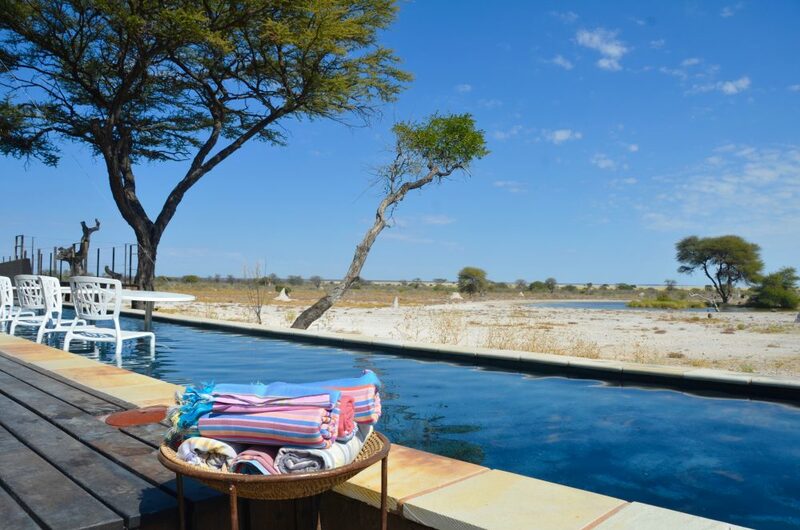 Standard procedure at any luxury lodge is to find respite in the splash pool overlooking the waterhole with a refreshing drink in hand. 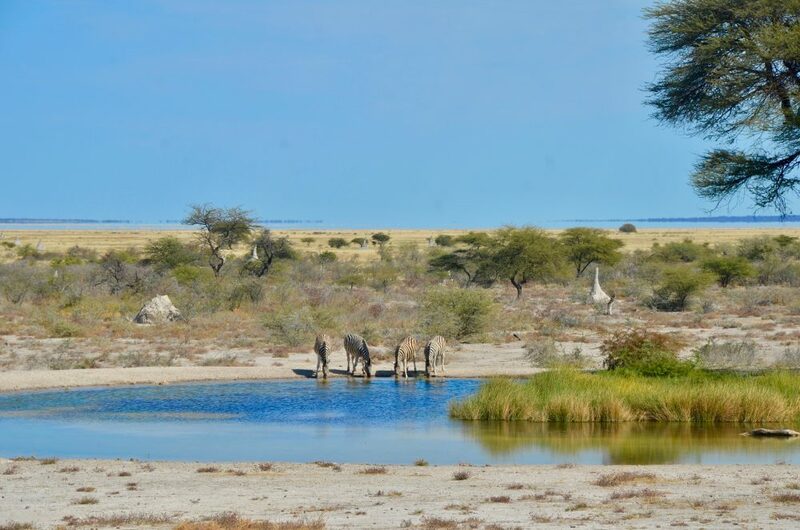 Onguma Nature Reserve consists of 34 000 hectares of Namibian wilderness. 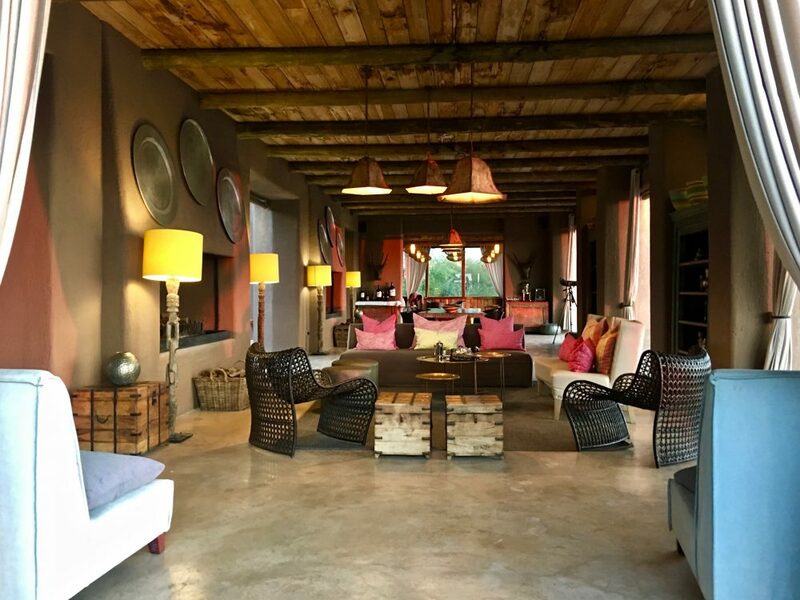 Abundant plains game, over 300 bird species ​and four of the Big 5 inhabit this slice of heaven on earth. This part of Namibia has been identified as one of the key bird-watching sites in southern Africa. At the water-level hide you get the opportunity to calmly soak up the marvellousness of nature. This is a favourite amongst photographers or anybody who wants to come into eye-level contact with Namibian wildlife as they bend down for a satisfying drink. 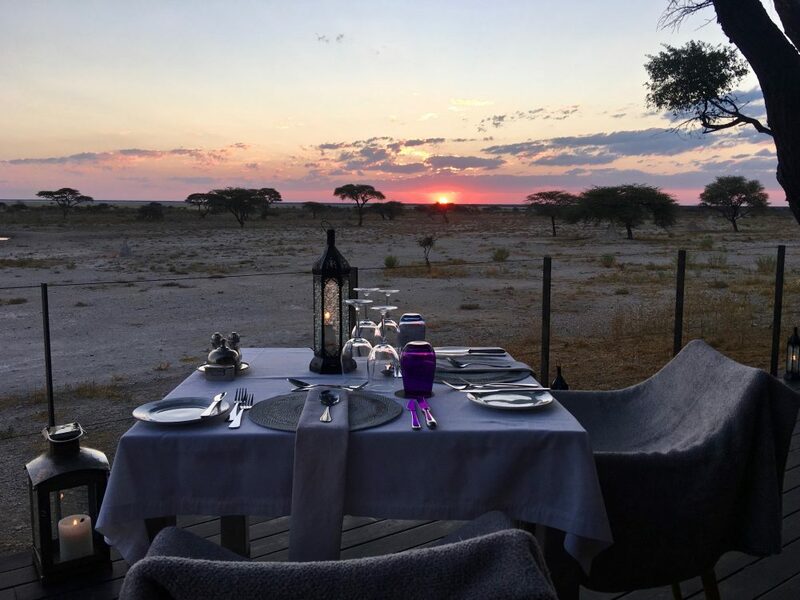 The reserve borders world renowned Etosha National Park. Fall in love with a mesmerising salt pan so huge that it can be seen from space! You can explore the 20,000 square kilometre park with your own vehicle or on a guided drive with a knowledgeable guide from Onguma. 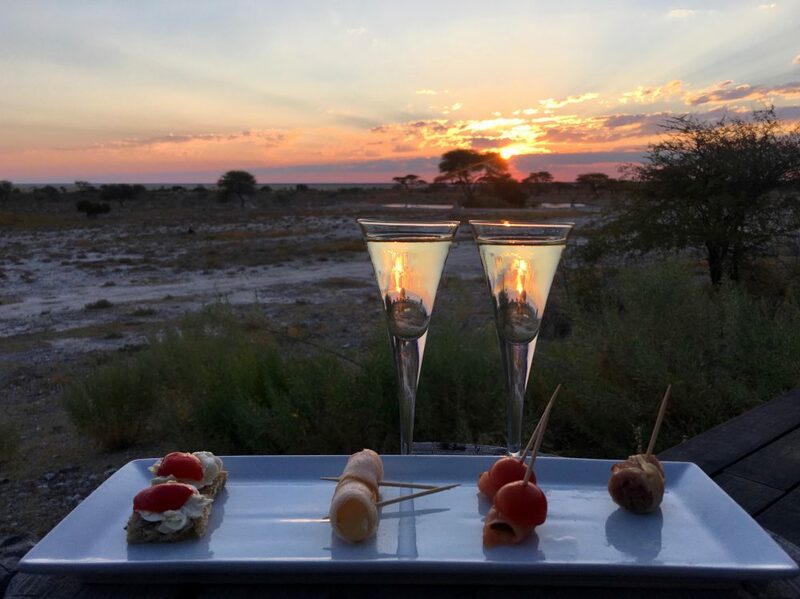 Become a first-hand explorer of the Namibian bush during a bush walk. Just like the massage therapy, this activity is a physical, mental and spiritual adventure. You get to see, touch and smell all the intricacies of the surroundings, which will unequivocally bring you closer to Mother Nature’s heart.